The debate between aquaculture interests and wild salmon interests continues to generate strong feelings. In this Guest blog, Fiona Cameron reflects on how the interests of Scotland’s wild salmon are being represented. Fiona is a writer and journalist. Her second novel (writing as Nancy McKnight) is due to be published within the next few months; one of its principal themes is the conflict between salmon farmers and fishery owners on the fictitious Hebridean island where the Balvaig Trilogy is set. Over the past decade, I have worked as a lobbyist and a public relations, marketing and communication consultant for Scottish wild salmon and sea trout interests. During that period, I also spent some time working for a salmon farming company which was, at the time, the most enlightened in Scotland in its attitudes to environmental stewardship – mainly, I suspect, because it was not at that point listed on any stock exchange. The experience of working for both “sides” has left me decidedly cynical about both, but also deeply convinced that the current system of riparian ownership does not serve the best interests of Scotland’s wild salmon and sea trout. Riparian owners appear to be primarily interested in conserving the value of their landholdings and fishing rights rather than the fish – though I admit there are some honourable exceptions to this. For instance, the manager of one such charity has used his prominent role to publicly call for the closure of a commercial salmon netting station whose primary impact is on the South Esk, a river where this same gentleman is a major riparian owner. Such an appeal could easily be construed as one owner of a valuable heritable interest using his position to attempt to close down the business of another owner of a valuable heritable interest. Where the waters get distinctly muddy is with claims that the argument is based solely on grounds of conservation of fish. Have no fish at all have been killed by angling interests on the particular river mentioned above? Is this not a case of “do as I say, not as I do” in relation to the commercial netsman’s right to kill fish? If the argument is a scientific one based solely on conservation, then riparian owners with direct financial interests in the rivers under question are not the people to be doing the lobbying. We should bear in mind throughout that Scotland’s wild salmon are part of our national heritage, both culturally and legally. In Scots law the fish are res nullius (wild things belonging to no-one) until they are caught. What is owned is the right to fish and there is a clear case for management of salmon and sea trout stocks to be overseen by government, on behalf of the people of Scotland. In a similar vein, we have the many tirades against salmon farming which are led and supported by riparian owners. This is a more complex scenario because salmon farming undoubtedly has adverse impacts on wild salmonids (particularly on sea trout) if it’s carried out in the wrong locations. However, the monocausal argument which riparian owners have advanced or supported to account for declines in wild salmon and sea trout stocks everywhere from the Solway Firth to the Pentland Firth simply doesn’t hold water. There are many, many causes for the decline of wild salmonids. The presence of salmon farms in certain locations is simply one of them and it may not be the most significant one. Monocausal rants simply damage the cause of wild salmon conservation since any argument against expansion of what is one of Scotland’s few successful industries in terms of export earnings will only succeed if it sticks rigidly to the facts. Hyperbole won’t cut it with politicians whose interest is in protecting national income. Headlines such as “Fish farms blamed as salmon river shares dive” (Scotsman 15 July 2013) above an article in which the main complainant was a banker who owns a share of fisheries in the River Lochy for which he’d paid a cool half-million are not calculated to promote political action to save wild salmon! In essence, I believe that riparian owners have to face up to their own role in promoting the decline of wild salmonids. Mills perceived a change in the angling scene from the early 1980s onwards, as fishery proprietors realised that salmon fishing could earn them big money. Some riparian owners began leasing their fishings to syndicates, while others sold time-share for high sums (vide the poor banker who squandered his half-million on a share of the Lochy). I’d say there should be equal concern over the way it has increased fishing pressure, as those who have paid high sums for a week’s fishing will want to fish come hell or high water (no pun intended). We are continually told (mainly by riparian owners and their spokesmen) that salmon angling is not “a rich man’s sport”. A glance at the guide prices in the annual auctions run by such stalwarts of conservation as the Salmon & Trout Association and the Atlantic Salmon Trust is enlightening. Such auctions will also include some offers of fishing at prices less than £200 to show just how egalitarian they are. It’s always the exceptions which prove the rule….. I fully agree with the spirit of Derek Mills’ book title. Something needs to be done to save Scotland’s salmon (and indeed, sea trout). But are riparian owners (whose vested financial interests can be considerable) fit persons to oversee this? At this moment when there could be an excellent opportunity to reform land law in Scotland, we have the best chance since pre-Victorian times to reform the laws relating to riparian ownership too. (1) For example, the Atlantic Salmon Trust membership comprises the following, at least five of whom have proprietorial interests in salmon fisheries. The Trust spent a total of £187,444 on “direct charitable expenditure on promotion of salmon conservation”. Despite the Trust’s emphasis on scientific research, a mere £12,098 was spent on this in 2013. In comparison, the Chief Executive’s salary amounted to £53,216, the travel and subsistence budget for two Directors was £16,732 and the PR budget was £26,711. Source: AST Accounts 31 March 2013. Interesting piece Ms Cameron though I don’t think the equivalence of faceless sea farm owners / versus crusty landowners stands up. There is ample evidence that fish farms are allowed to get away with stuff other industries could not – as you say, the jobs are important. And while the Laird of Tattie Bogle can still get away with stuff he shouldn’t, I can guess whose side the salmon would be on, were we to have interspecies communication – I have been bitten by effing seal lice myself off Braes beach and it is a horrible experience. And not all salmon rivers are owned by men clad in ancient tweed demanding a golden torc for a beat – I live in Glasgow just a few yards from a fine salmon river, the Kelvin and there is a real community of anglers looking after the river’s interests (and we have a pair of otters nearby and the anglers don’t begrudge them their salmon). Absolutely agree with Edwin Moore re the way SOME rivers/beats are being managed – that’s why I mentioned ‘honourable exceptions’. There are even a few pretty tweedy types who are doing the right thing, and aren’t fixated on property values. Sadly, I think they’re outnumbered by those who have a different system of priorities. Anyone who pays half a million for the right to fish a beat then bellyaches because the value of his investment’s gone down doesn’t get my sympathy, I’m afraid. Nor does whoever sold it to him! Fiona, the interests of Scottish salmon aren’t affected one iota by whether one fool paid over the odds for a stretch of river. They are badly affected, however, by the wholescale removal of netting. There is nobody now controlling seal numbers in estuaries and along migration routes. Just recently I observed a new seal colony near what probably used to be the most prolific fishing spot on the west coast. There were never any seals living there in the past. That is, the occasional seal ventured there to get some fish but it was usually rewarded with a bullet. Aye given another 18,000 years the seals will perhaps wipe out their prey base, but in the meantime it’s OK to have squillions of sea lice, inshore trawling, gill netting, trap netting and sweep netting as these have no effect on salmon numbers. I agree with you here for the most part. To be more specific, not all rivers are managed by men in ancient tweed, as you put. Unfortunately, you do not own the River Kelvin, you are merely tenants, renting the salmon rights from, I believe, the Crown Estate. They can put you off, they can put on a syndicate, or they can let it on a day-to-day basis as happens on the exclusive beats. There is also a problem in that the permit price, in comparison to fishing in most of the Commonwealth and US, is high. Secondly, the division of Scottish associations is very parochial. It’s only correct that people from around the Kelvin have a say in the running of its angling, however, wouldn’t it be more beneficial for all Scottish associations were one ticket to give access to all waters within a larger area? At the moment, the complimentary ticket system is in place on many waters, with one club having swap tickets for another, and it works well. It does seem a touch out dated, however. Good anglers – and by that I mean those who practice c&r and are respectful of both other anglers and the environment – should have the freedom to wander all the association waters so long as they have a permit for one. This would cost no more or less, and the only barrier seems to be the small-town attitude and ludicrous fear that ‘they’ll take all our fish’ prevalent in many areas. Lastly, a right to buy salmon rights and riparian strips (which would bring trout/pike/perch etc rights) under a national body would free up cash for the policing of association waters by trained, full-time bailiffs with the power and time to deal with those ruining angling for us all. I wonder whether the usual suspoects will start waxing lyrical again how wonderful things are in Norway. Norwegian owned Marine Harvest just announced third quarter profits of £83m from its salmon farming operations in 22 countries, it forcasts production for 2014 of 405,000 tonnes. The firm employs 450 people throughout Scotland and 10,400 employees worldwide. It is listed on the Norwegian stock exchange and is just one tiny spech in the empire of the oil tanker, drilling rig and oil supply vessel tycoon John Fredrikson. Scottish Sea Farms, the second biggest producer of fake salmon in this country, is owned by Norwegian outfits Leroy Seafood Group and SalMar. Just for comparison, the Scottish netting industry used to employ 2000 people for an annual production of 2000 tonnes of proper fish. I have often pondered whether we should regard the ‘Scottish’ salmon farming industry as Norway’s revenge for the fiasco at Largs in 1263 and The Treaty of Perth in 1266. Pray tell Reiner; how much land do you own in Norway? What acreage of land in a Norwegian National Park could Herr J. Fredrikson buy for his own personal use compared to what he could buy in Scottish ‘Strath-ersatz ‘national parks’ and yes I noticed the silence from some of the other ‘usual suspects’ on Derek’s and my blog. I rather think the fish think of themselves as ‘real’ and ‘proper’ whichever side of the net they are born! Fish farming is a reality and an activity that has been practiced for countless centuries and on scales ranging from a small ‘stew’ to industrial scale lakes. It needs regulating and being done with full regard to bio-security – hygiene etc but one thing is certain, it isn’t going away! The problem with that is, we fished our wild stock to destruction (and polluted the rivers and wrecked the spawning grounds …) long before the fish farms were started. But it was (primarily) Scots that did it, not the Norwegians. Throughout the mediaeval period, the apprentice boys of Aberdeen rioted on many, many occasions. And their principal grievance was, they wanted to have one day a week – just one – on which they were not fed salmon. Salmon was the most abundant and cheapest food in Scotland, cheaper than oatmeal. To get from that great wealth of fish to today’s scarcity has taken more than a few foreign owned fish farms. Simon, have you actual historic evidence for your Aberdeen apprentice story, or is it just hearsay? I have heard the same story repeated so often about so many places so many times that you must forgive me for being a bit sceptical. As to your second point, no, that is not so. The netting station where I used to be foreman and skipper had its best season ever in 1979. We only worked four nets that year, far fewer than the old guys did in the past, though they were more intelligently designed and sited. The marine biologist Bill Shearer did a lot of work at the time, we tagged a lot of fish for him and released them. I can’t remember the exact figures but the take from the nets was certainly not more than 12 or 14 percent. Discounting the early experimental sites of Martine Harvest, fish farming begun in Scotland in earnest in the early 1980s. We noticed an immediate impact on fish behaviour. We could see them jumping over the head rope beyond the nets. They kept further away from the shore, the reason being, at least that was our reasoning, that their acute sense of smell caused them to do so. For this one has to know that returning salmon are very lazy, they just swim along with the currents. West coast bag nets were generally placed where the currents took them close to the shore. Whenever a fish farm up, the currents flushed faces, smells and rubbish from the farms into the same places. The fish actively avoided them. We tried to entice the fish into the nets with outriggers. It didn’t work. Additionally, there was a natural population decline – salmon runs always had their ups and downs – which in the past would have been counterbalanced by higher prices so that fishing remained profitable. In 1980, that was still the case, the price even for grilse never dipped below £2.50 per pound – a lot of money if you’d converted it into today’s prices. The following year, however, the market was flooded for the first with fake salmon. The consumers were duped (as they still are) into believing that salmon equals salmon. Prices collapsed, and netting became unprofitable. River interests took advantage of it and bought out more and more netting stations in the mistaken belief that the netsmen were their enemies. This had the effect that I mentioned before: Nobody kept seal numbers under control any more. Now there are far to many of them, they gorge themselves on the fish that are left. A last thing. When I say, consumers were, and are, duped, this is based on that Scottish (wild) salmon is basically the same as Norwegian or Irish salmon. But Scottish salmon was always regarded as the best because the specific catching methods employed here resulted in a superior product. What is being sold as Scottish (farmed) salmon nowadays is, however, the same rubbish that you can produce anywhere. So the the salmon farmers still piggyback on a reputation that was built up over generations by the netsmen but that has no validity in fact any more. There are plenty of contemporary records of the salmon riots in Aberdeen, yes, although I can’t give you chapter and verse tonight. I am slightly winging it when I say ‘cheaper than oatmeal’ – however, the apprentices did complain of their repetitive diet of salmon, they didn’t complain about being fed oatmeal. Contemporary accounts do say that the salmon was extremely plentiful and cheap. As to saying your nets had their ‘best season ever’ in 1979, I respectfully suggest that you probably don’t have records going back more than a hundred years. Salmon fishing in the Solway was in serious decline in my childhood (1960s and 70s) because there were so few fish being caught. In the 1980s the fisheries at Kirkcudbright and at Balcary were abandoned because they were no longer economic – partly, as you say, because of competition from farmed stock. But if they had been catching thousands of fish per season, as (if the Aberdeen chronicles are true) they would have been in the twelth and thirtienth centuries, they would not have been uneconomic. However as I remember it, by 1980 six fish had become an exceptional day’s catch, with one or two fish being more normal. A stake net is not, after all, a very expensive investment to maintain. You had to catch quite a few thousand fish before you covered your fixed costs. Six fish a day? Oh boy! Most rivers contained salmon and trout and it was readily available and cheap. The London apprentices also used to complain about a constant diet of salmon and rioted on at least one occasion. The whole of Europe must have been rioting. Same story along the river Rhine. Funny that it is alway the apprentices. Rumour has it that scottish salmon farms cant compete against norwegian etc because of the rent extracted from them for no benefit by the crown estate bloodsuckers. just a wee narrow-minded separatist from another’ too wee’ country commenting on the productivity of its salmon-farming ‘colony’ within the colony of a big broadminded country that used to have an empire. A fascinating article, particularly the details of where the money goes. The advantages of an organisation gaining charitable status are more than just financial. Charities are seen as ‘good’, and this subliminally lends them authority. (It’s interesting to note at this point that Eton School is a charity, while Amnesty International UK is not.) Disagreeing with a charity is like punching Pudsey Bear in the face. Here in Scotland I can paddle my canoe almost anywhere I want, providing I act responsibly. I can do the same in almost every other country in the world. Except England and Wales. There, paddlers can only access 2% of the rivers and lakes. The Salmon and Trout Association, and the Westminster government, say that voluntary access agreements are the way forward. Over the past twenty years this has been spectacularly unsuccessful in increasing access for paddlers and swimmers. It is a recipe for the status quo. In fact, the legal situation regarding river navigation in England and Wales is somewhat unclear, and the angling organisations have been very reluctant to push the matter to a test case. There is a body of opinion that there is a public right of navigation over all inland rivers unless it has been extinguished. Interestingly, some rivers which unquestionably do have a public right of navigation are still covered with no canoeing signs. Canoes and kayaks are shallow draft and there is no evidence they cause any harm to fish. I had hoped the Salmon and Trout Association would have based their access policy on scientific evidence, given the Associations stated raison d’etre. It seems to me their current access policy has the more to do with protecting fisherman rather than fish. After reading Fiona’s article I have a strange sense of deja vu. I have to admit to being bemused by the conflict south of the Tweed. In Scotland I have never had my fishing disturbed by the passage of a canoe, and I have never met any hostility from anglers while paddling, though I believe commercial rafting on the Tay has caused some difficulties to anglers. With unrestricted access to so much water, it is no hardship for paddlers to voluntarily avoid situations where conflict may occur, which is why I don’t paddle the intensively fished Lake of Menteith. The success of the access legislation in Scotland is awkward for those who want to deny people access to water in England and Wales. The usual argument to claim ‘well, it wouldn’t work here’ is to point out the difference in population density. But our access laws work very well even in areas close to major urban centres such as the Trossachs. In England/Wales some of the worst conflicts arise in fairly rural areas. There’s room for all on our waterways. I imagine those taking issue with a canoeist are the same people who take issue with anyone but the sup-rich fishing the beat they own. good stuff, expose it all. Salmon trust spend 12k on scientific research while they give the cheif exec 53k. Same old story, the privileged millionaires control it all, in my part of Scotland you get chased if you put a rod anywhere near a sea loch, control of the rivers is not enough for them. Recently when the laird went back home and left the country after a fishing trip, his two game keepers were spotted netting the river! Exactly the reason why community ownership of such assets would be the best protection for our Salmon and sea trout. How could you go poaching if you had the whole bloody community on your back? If your talking about the keepers, they don’t have ‘the whole bloody community on their back’ they make their own rules. And it’s not poaching when they do it, it’s then called estate management. And if I don’t talk about keepers? reiner, what you on about? you just dont get it. when the community own an asset their attitude completely changes, they then want to protect the asset. Game keepers are just community police, keeping 99% of us away from salmon and deer. the 1% professional poacher, if encountered by a game keeper is quickly dealt with by the real police. Yes, Slurry Stirrer. Reiner might find it helpful if he outlined some kind of strategic philosphy/management policy that we could engage with in discussion. Right now it appears he wants to swat moths, because a bee stung him —————-and if it has wings! Community control, but not ownership. I’m sure you’re aware salmon are not owned by anyone, as this article highlights. Why then should one rural community control the fishing, and with it prices, only to grow as rich as the large landowner before them? This still leaves the ten year old from Shettleston a complete outsider and utterly impoverished as he’ll have nor river (or at least a very much smaller share in one), and the working class angler from Fife unable to fish his own rivers. Nationally owned, locally controlled, under a state license. Those fishing the Junction Pool on the Tweed can also pay for the state license – on a weekly basis if need be – as is the case in most modern countries. The monies from these people, many very wealthy, can go towards funding a national fish and game council which can fund the proper bailiffing of smaller associations which cannot afford it. 1 Their is 100% compulsory catch & release on the South Esk. Hence, no fish getting killed there. 2 You can get a day’s spring salmon fishing on the Tay at short notice for less than £50, no problem. Whther you think whether that is expensive or not, depnds on what you compare it to. You can also get salmon fishing on the upper tributary rivers for £10-20, or you can join any one of the many excellent local angling clubs that have their own club water… some of the best on the river in fact. Many ghillies will quite happily let you fish for nothing if it means they have a pair of eyes on a particular bit of river. 3 Most salmon research in Scotland gets done at an individual salmon board/ river trust level. It is not a top-down structure by any means. Local boards do the work and spend the money. AST and others work more at a lobbying/ PR level… hence the figures that are the subject of the article. The Tay, for example, has about 3 X the budget of AST, and most of it goes on fishery protection, habitat works and Tay-specific research. If there is 100% C&R on the S Esk, I am puzzled by the fact that the Scottish Government’s own statistics show that 132 salmon/grilse were caught and killed on the S Esk in 2012? 132 fish killed by anglers. 3439 killed by coastal nets at mouth of the river!!! Realised I’d omitted the figure for grilse caught – that’s another 119 on top of the 132 salmon. I realise that (a) most of these would be ‘skinny grilse’ (entirely due to the problems they’re facing at sea, nothing at all to do with salmon farms) and therefore less valuable to the breeding stock. (b) It’s still a much lower total than the Usan nets, but then I thought a large part of the objection to these is that they take fish from more than one river? You make valid points here about the local angling clubs. There are many excellent ones to choose from. It is still managed on a parochial manner however. Most modern-thinking anglers can see the silliness of having five tenant clubs on one river, when a right to roam all the stretches/beats/associations should be available over not just one river, but all association waters in the country within a set price region. Many associations are under £100. Lastly, £50 a day on the Tweed is outrageous in comparison to Nova Scotia, New Zealand, Montana. Apologies… the 100% C & R is just up to 1st May. But the point I was trying to make still stands…….. riparian owners will take action to preserve stocks in their own rivers if they think that angler pressure is detrimental to the population as a whole. 123 fish retained during the summer months is not a lot for a productive river of that size. Couldn’t agree more, Simon. I carry no torch for the fish farms, some of them are sited in what are patently the wrong places in terms of salmon & sea trout rivers, benthic impact, poor flushing, etc. But there’s no way they have CAUSED the current wild salmon crisis, however much they may have contributed to a worsening of it in certain places. I think that poor management and sheer greed over a very long period did the serious damage. There’s a pressing need to address that, because the salmon as an iconic species is an important part of Scotland’s cultural heritage as well as her biodiversity. Fiona, the problem with Scottish salmon has always been that too many people who knew very little talked too much about it. If you get the whole community involved, rather than those who really care and have a stake in it, that will be even worse. District Salmon Fishery Boards are the obvious bodies for devolved river management. The problem is that there is no proper bridge into what happens at sea. But whatever the sum of the causes of population decline, continuing to fish when the population was known to be in decline or when it was known to be far below a healthy level (which is currently the case for all our commercial sea fish, even those whose populations are now recovering) can only be described as irresponsible. Talk of apprentices or seals overfed with salmon and of sea lice and netting stations doesn’t actually advance the debate, as fascinating and controversial as it may be. The decline in salmon and sea trout numbers is plainly a multifactorial problem riddled with blind alleys for zealots to disappear down whilst others exploit the disarray and laugh their way to the bank. Let’s try and look forward. I agree wholeheartedly with Fiona Cameron and quite frankly I despair of there being a solution as things stand – the actions of salmon farmers, riparian owners and Scottish Government, and the inactions of SNH, will surely conspire to see the effective demise of salmon and sea trout in parts of Scotland, particularly the west coast. Where does the solution lie? In more rigorous application of EU Habitats Directives perhaps, or in broadening interests by reforming ownership of the asset during its coastal and freshwater phases. Maybe a bit of both. Ian I take your point about comments on sea lice and apprentices not advancing the debate and as one of the contributors to those comments I agree with you. However I would observe that they are for the most part made as replies to comments not comments as such and should be regarded as asides between participants and not as full blown contributions to the debate. It’s no different to the sort of thing you would get in a meeting where someone makes a quiet remark to one of their neighbors that is heard by but not intended for everyone else. Iain, your suggestions are a breath of fresh air. I have despaired of the points-scoring that goes on among the parties involved (vide today’s press release about salmon netsmen from Disgusted of Tunbridge Wells aka the Salmon & Trout Association). As a non-angler but someone who loves to see salmon in our rivers, I’d like to bang some heads together. As far as I’m concerned, it’s the job of the government and its agencies to look after our common resources, and their heads (specially those in SNH and SEPA) need the biggest dunt of all, because they’re fiddling while Rome burns. As you say, the answer is surely in better implementation of EU law – something the excellent (voluntary!) Save Seil Sound group is pursuing – not on behalf of riparian owners, or netsmen, or any particular interest group, but on behalf of the environment and the critters in it. Fiona, a ressource, if one wants to give that awful name to wild animals, is not rescued because it is iconic, unless it’s a Panda – certainly not by trying to bang heads together. The only way is to give economic incentives to its proper management. Quite a few African countries haved done that successfully with elephants. In the Scottish scenario, I think it would only work if netting were reinstated to fulfill its proper management role that it had in the past. It includes keeping seal numbers down, monitoring stocks and be open to scientific research. It has to be quite tightly regulated in conjunction with District Salmon Fishery Boards, of course. The other side of the coin is, fake salmon must not be allowed to be sold as Scottish salmon, but have to be properly labelled as “farmed salmon”, as an entirely different product. There has to be a huge price differential between the one product and the other, just as there is between Cava and Dom Pérignon champagne. Otherwise there will never be a netting industry again. And if there is no netting, the decline will continue. One thing we appear to have lost sight of in the nature/wildlife debate in general and this thread as well is what is the root cause of the decline in salmon stocks. 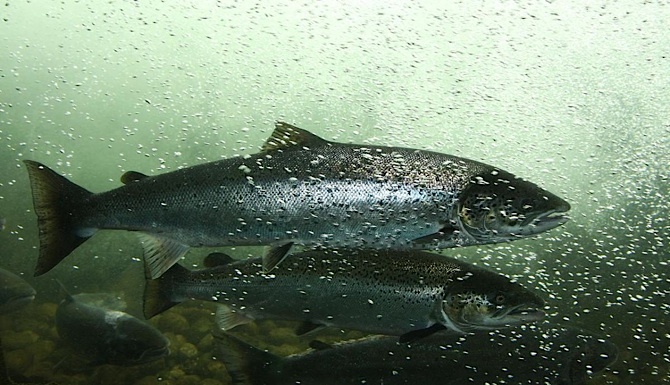 Salmon farms can have an immediate local effect there’s no question of that and it requires strictly enforced hygiene and bio security measures; but it is not by any means detrimental to free swimming wild salmon. Seals catching and eating salmon, oh dear, oh dearie me, they mustn’t do that must they? after all they don’t have a license. What nonsense, it’s a food source for them and if their food sources decline so will they and while there will be a lag there will be an eventual balance. I would suggest the biggest problem is man, the most destructive animal on the planet. It’s our mismanagement of land and inland waters. Poor waste management and the resultant pollution. Over reliance on chemicals to both boost productivity from marginal land that is being poorly managed to start with; and to try and repair depleted soils that should really be allowed to lie fallow for a few years. What about looking further off-shore – how many salmon appear in the trawlers ‘black fish’ catch? And what about Sand eel decline? Having now watched this blog for two weeks or so there seems to be a general trend to make simple matters difficult rather than difficult matters simple and a constant identification of problems rather than solutions. Out of interest, did anyone submit a response to the recent Aquaculture consultation? I would also be interested to hear of a river in a crofting community where there is a recent recorded salmon catch return. There are well known spate rivers in such areas where there used to be high returns but for some reason returns are no longer submitted. Is this because they are exempt or over-exploited? Can anyone enlighten me? Rural Rascal. Many still have decent runs of fish. Amhuinnsuidhe on Harris, for example. The salmon rights are not owned by the North Harris Trust, however, as is the case in Assynt. The latter had an awful season, and a visiting angler from London had no fish for a week and won’t be back. Let’s hope this trend continues and the owners of salmon rights continue to have less income. Ah yes, Amhuinnsuidhe on Harris for example, at a cost of £33,928 inc VAT for the week, I’m intrigued that you think that this is representative of affordable community fishing. I would suggest that it is important to remember that a visiting anglers trip to the Highlands is more than just about catching fish (although catching fish obviously helps in guaranteeing their return)and their financial contribution towards accommodation, employment etc is just as important as their fishing rent. I note from The SAFC website that you are proposing free fishing for under 12 year olds…..the Helmsdale already permits this on the AA water for under 16 year olds. There is plenty of good, productive, sustainable fishing available on estates all over the Highlands available to day rods for £25 – 50 per day and by taking up such offers visiting anglers will help to preserve existing employment vital for fragile communities. A far cry from £175 per rod day at Amhuinnsuidhe! Yes, I’m aware of the costs and that many are cheaper than Amhuinnsuidhe. £25 a day is still far too much money to go fishing for a wild fish, however. Furthermore, almost every single top stretch is outwith the reach of the vast majority of this country, with the profits going to someone who doesn’t own the fish. Nature will take care of itself, & it doesn’t need a guy staying in London making fortunes from it to keep it healthy. Ghillies, hotels. Amhuinnsuidhe guests tend to stay in that hotel. Were it more accessible, more anglers would stay in Tarbert, giving money to the local community and not a super rich hotel owner. Guides, not ghillies. There are fishing guides in every country, even in those with state licenses. New Brunswick non-natives must pay for a guide. I’d imagine they’d get far more money were the fishing itself not so expensive. My country’s resources do not exist to provide sport for rich foreigners before the people who live here. Scotland’s angling laws are the most imbalanced of any Commonwealth country, and even the US, yet some people try to patronise and lie to us that everything is going well under Lairdy Smythe-Tomkin. Quite unbelievable. I feel that there has been a detachment from reality again in this blog. If fishing did come under Government control what would the annual cost be? £25m, £50m, £75m? Perhaps a good starting point would be to quantify riparian owners current annual contributions to DSFBs and RAFTs, two bodies which currently maintain many fisheries with little if any public finance. In turn these fisheries support a wide range of rural employment such as bailiffs, gillies, fishing tackle suppliers, hotel staff, lodge staff, all of which are essential in fragile rural communities. RR, correct there is a persistent detachment from reality. Non man made natural features, ie land, rivers and lochs continue to be viewed by landowners(large estates) that they are responsible for all associated activity. These natural assets do not require the old fashioned system of laird and tenant. In stead of lairds crowing on about how jobs will be lost, or money will not come to these areas if we meddle with the system, we need to accept that all of this is possible and even easy to improve, without the private ownership of absentee lairds. Fine, SS, but management comes at a considerable cost. And who are you proposing is going to pick up this tab in your vision of utopia? I am also intrigued as to how an absentee laird is defined. One who owns 20 acres and visits 4 times a year? Or one who owns 200 acres and visits 8 times a year? Or, one owns 20,000 acres and visits 12 times a year? I can think of landowners in each category and as always there are good and bad examples but they all currently contribute in one way or another to the rich social, economic and environmental mosaic of the Highlands. We, as members of the public are also able to actively contribute to that mosaic through the planning process, land use strategy, forest strategy and reviews of relevant legislation so I am struggling to see what your issue is apart from envy perhaps. And by the way I’m neither a landowner nor a member of SLE. RR, management costs? what are you suggesting, the people of Scotland and their communities couldn’t manage to sort it out? Absentee laird is anybody who owns land/fishing rights and chooses not to reside on that land. Not sure how you think someone who owns a river but lives in another county/country contributes to the “rich social, economic, and ENVIRONMENTAL….eh? mosaic of the highlands”? If you are struggling to see what my issue is, then lets start with being asked to leave a remote hill loch because i don,t have a permit and being told to stop fishing in the sea with a rod because there is a ‘chance you might catch a salmon and the laird is at home’! Pathetic, out dated toff protecting community destroying garbage. Nothing you can do about the hill loch situation until we get a riparian strip system like New Zealand. With regards the sea, tell them to leave you alone. You are fishing for pollack, saithe, and flatfish. He owns the right to fish for salmon, not the right to fish, and there’s nothing he can do. I fish a stocked loch, which also has a sea trout burn under the permit. I know a local guy spins for sea trout with no permit from the shore and has had decent fish. My reaction? Good luck! Every fish he catches goes back and he has every right to catch them as a tax paying Scot who lives here. Different story on the loch, as we paid for them, but you can see the clear difference. That’s why I’ve referred you to the Wye and Isk Foundation – cost £1.4m pa for two rivers, with encouraging results. SS, so your laird category also applies to a landowner with sporting rights who works off-shore? I can think of many in that category who would be amused to hear of their new classification. Have a look at the guest blog on our website from Doug Emmet, Kiwi fish and game council chief executive. He outline show it’s tan there very simply. The irony is that NZ actually has a stocking program for it’s trout, & ours is completely natural. On that, I’ve never seen a ghillie on any of the wild trout lochs. Would tha landlords be willing, then, to donate a riparian strip to the people, seeing as they don’t support this vital chain of employment they care about so much? The other poster who uses insulting terms such as ‘detachment from reality’ uses the same scaremongering waffle so common with those who have no argument. I have seen many gillies and boatmen on hill lochs and I have often acted as boatman for others. It is a service that many visitors are keen to pay for and luckily the resource is still there. I am fully aware of the NZ model and have been fortunate to see it first hand. It works well in an underpopulated country. There are equally good models closer to home such as the Wye and Usk Foundation which has now been up and running for 13 years with proven results and a strong following. But again the works they do cost money, £1.4m in 2012 but they employ a wide range of people to improve the habitat and they provide fishing for a wide range of fisherman. And as for £25 per day, there are coarse fisherman who pay far more for carp fishing on stocked ponds as well some who happily pay the same to watch football, so I would maintain that there is plenty of affordable and productive salmon fishing in Scotland. If you want the best it generally comes at a price. Stocked ponds – exactly. Salmon are wild, as you know, and no one should be able to own the right to fish for them. The price you mention is the main factor here. I’m not poor, but can’t compete with bankers from London or Dutch millionaires. It’s my country, I live here, and I expect to come first. New Zealand may be underpopulated, but I’d imagine – and no, I’ve not checked – its density is similar to the Highlands. Scotland is large enough country with only 5.5 million people and an utterly huge amount of water. More than enough to share. I’ve no problem with people acting as ghillies on hill lochs, so long as the guests realise they’ll have to share. Landlords/salmon right owners do nothing on our some rivers, live abroad, but take money from local anglers. This has absolutely no place in this country. Rural Rascal, salmon catch returns must be submitted to ASFB annually by District Fishery Boards, they are legally bound so I am not sure where your “such areas” are that ere avoiding these regulations? I don’t hear any solutions to the problems faced by salmon coming from you either? Do you have anything to contribute on this front or are you playing permanent devil’s advocate here? I’m sure you know what this does to salmonid populations? As stated here, the problems are wide ranging and start right from the management of spawning grounds. Habitat restoration gains lip service at best! This is a critical error and ideological ignorance of the highest level. Most landlords unfortunately have no business qualifications, they are bred into estates and run most of Scotland like idiots! Communities in Norway show exactly how to run rivers for the benefit of their people, admittedly they are not so hot on conservation but they don’t shut up shop like many highland rivers. Communities are more than capable of managing rivers aided by fishery trusts, ASFBs, SEPA, SNH and local development trusts. Ah, the holy grail of Norway at long last! ah, the standard patronising SLAE comment! Have pointed SAFC towards the Wye and Usk Foundation for starters, up and running for 13 years with proven results all around. But it costs £1.4m to achieve. Out of interest, what’s your view on the cost of living in Norway? SEPA don’t seem too keen on challenging landowners. Cattle etc on spawning beds, as you say, but then if a tenant association complains, they don’t get fishing the next year, so they can’t. Riparian strip system such as in New Zealand and a national angling body (a proper one) which defends anglers and rivers from this sort of thing. Catch returns. Any association with a decent return would do well to lie through their teeth. I know of anglers who regularly forget how many salmon they catch, though I can’t speak for the associations themselves. I’m know somewhat lost by SAFC, who I had hoped would engage in meaningful debate. You are suggesting that just because something is wild it can be exploited by all and sundry? And if people don’t feel they can afford to fish they can carry on regardless? New Zealand is approx 3 times the land mass of Scotalnd with approx the same population. A key difference is that we have a further 55m people to the south, an increasing percentage of whom all travel north to fish, play golf, hill walk, holiday and help underpin the Scottish economy! How do you propose charging/stopping them enjoying the rights you wish for in your utopia? And back to cost, how much do you think it costs, yes costs, to look after a Highland River, in terms of habitat management, bailiffing etc? We have to go back to basics, without the management there will be no salmon. And yes there is well documented scientific evidence of this all over google! By the way, what’s your view on beavers? RR, are you suggesting that a successful salmon river requires the backing of an extremely wealthy individual? what about a beautiful natural(no physical management) river, main part about 4 miles, protected by two keepers. No fishing allowed, no permits available. Exclusive use for the family of the laird who lives out side of Scotland? Unfair or not RR? Go and try and kick a ball around at Celtic Park and you may be told “No football allowed” – is that unfair? I’m now somewhat lost by Rural Rascal, who I hoped would engage in meaningful debate. The people of Scotland come before the 55 million to the south who want to fish here. They don’t live here. They can fish, there’s more than enough for all, but they can pay a state license at a higher cost, as is the case in Canada. I’d imagine they’d be stopped by the same sort of bailiffing system in place in all Australia, NZ etc – you understand this well though. They could also sort out their own country – and I’d wish them well in doing so. No, not all and sundry, and not exploited. Controlled if need be. Catch and release is practiced on many association waters which have hundreds of members on small stretches and they have healthy runs. They don’t have money to look after them, because rivers look after themselves. You’ll lie through your teeth to have the weak minded believe salmon only run beats controlled by millionaires, though. All the people who want to fish in Scotland do fish, there’s not going to be mass fishing simply because rivers come under public ownership, that’s borderline hysterical. There are miles of untouched river and loch, and again, you are well aware of this. Those on top beats are paying for exclusivity, not quality of fishing, in many cases. Have no opinions on beavers, to be honest. I believe all animals have the right to the countryside. I don’t think they need controlled or managed, just left alone. Can I ask you something now – hypothetical situation: An association’s rights are owned by an absentee landlord (owns salmon rights, doesn’t live in Scotland). It’s got 500 members. They get the right to buy under future legislation. They buy it and it becomes part of a national body of waters fishable under state license. Will it then be over fished, abused, poached, and will the salmon then magically vanish because the landlord doesn’t own it? You say, “all animals have the right to the countryside. I don’t think they need controlled or managed, just left alone.” By the same token, why not leave salmon alone instead of yanking them out of the water, crippling their mouths, and then chucking them back. Strikes me as rather cruel. I’ve never understood these guys who catch fish without the intention to eat them. It’s completely beyond me. The only exception I accept is tagging for research and management. SAFC, what happened on the Hamara River, Skye? Or the Armadale Burn, Sutherland? Were they dammed to produce power for the Egyptian hydro-electric scheme? RR, celtic park is a ‘man made’ structure. Total fair to be asked not to play football on it. The soil and the grass? Man made? Really? Celtic Park is the name of the stadium, soil and grass maintained by human effort. You know this, & you’re not as stupid as you’re trying to make out, but such childishness leads to a waste of time. are you 10 years old RR? further up you call for meaningful debate! Or perhaps removed, brick by brick, to Holland, like London Bridge? Looking at various reports, Hamara River is an example of watercourse that went under community control and the salmon disappeared due to over-exploitation. 100 fish per year to zero. I’ve been intrigued to watch the exchanges re ‘community control’. My original contention is that riparian owners with a hefty financial stake in fisheries are not the people to oversee conservation of wild salmon stocks, because many of them appear to be blind to the conflicts of interest that arise where the value of their real estate is concerned. However, I’d never advocate a free-for-all in terms of management. It needs to be overseen by qualified & knowledgeable people who have no interests at heart other than those of the welfare of the fish. Yes, that will come at a cost, but hopefully not at the cost of our native wild salmonid stocks, which I feel is a risk we run under the present system. my vision would be community ownership, fishing permits available at the post office. (revenue going to kids christmas fund) Local angling clubs carry out maintenance in return for cheaper permits. Poaching will decrease, but many ‘community eyes’ who genuinely care for the river will call the cops when professional poachers visit. A natural asset available for ALL to enjoy, perhaps overseen by an organisation like SEPA? i know the Lairdy types will not like this, so please attack my suggestion, but spare us the ‘utopia’ response, hardly suitable. I agree with most of this, but it’s hard to define ‘community’. Some town beach traditionally stretch through the town below – who then would have the right to buy? IMO it can only be national, or county by county. Some of the current associations are so parochial (not allowed on the water unless you’re a local etc) are as parochial as the lairds are aloof. And again, the genuine poor boys in Possil etc have as much right to fish the Helmsdale, for example, as a local. There’s no real danger to fish stocks unless people go mental like what happened in the 70s / 80s with everything chapped. Obviously the lairds will lie about this, but they only care for conservation to increase their own profits. As I said, the Kiwi system has it’s own biologists, bailiffs etc, & all under a state license. What the apologists for the lairds will never admit is this: take away the costs of fishing itself, & far more money can go into conservation and policing. As I have said before, have a look at the Wye and Usk Foundation, an interesting and achievable model but it also reflects realistic costs. It is Scotland that is odd man out here. We need a national wildlife SERVICE as is found in North America, Fennoscandia and the Antipodes. Putting the biological management of a natural resource into the hands of the main user group is crass stupidity. I find all this a bit inconsistent. We keep hearing in the context of farms that their management should be in the hands of their owners – i.e. the tenant farmers once they’ve been given a right to buy. They, the people on the ground, with a stake in the ownership, are the only ones qualified to manage etc. etc. OK, the farms and fisheries analogy is not perfect but how would the ARTB firebrands feel if the proposal were to transfer their landlords to the community (who know how to manage your farm better than you do) and you, the tenant, have to go and periodically renew your lease at the Post Office (proceeds to the kids’ Christmas party)? Also – as I pointed out yesterday, I for one have never suggested that management should be ‘handed over to the community’. There’s a world of difference between leaving management of what is surely a communal resource in the hands of parties with a financial interest in grabbing a piece of that resource for themselves, and having a free-for-all in terms of management. What I believe we need is management by qualified and impartial people – i.e. those who do NOT have a financial stake, and whose prime interest is in maximisation of the resource rather than maximisation of real estate values & income from fisheries. On another tack, following up some earlier exchanges re impacts of salmon farming, it should be borne in mind that more than one riparian owner derives/has derived rental income from salmon farmers, either for shore bases for marine farms, or for placement of freshwater smolting cages (and I understand that the legality of allowing such cages on a freshwater loch may be a somewhat grey area). I don’t seek to blame those riparian owners who have a double standard. I think an element of double standards is inevitable when you mix management of a scarce resource in with a financial stake in that resource! Fiona’s comments are exactly what Ron Greer said above, and the SAFC position. There are many community run – albeit not owned – salmon rivers in Scotland, and many are ran fine. However with declining salmon runs, some are unable to change – members killing four fish a day, members killing fish as coloured as the soil etc. This needs stopped, and professional people should be employed to stop it, and this does not mean the owners of large estates, or DSFB, who are interested only in themselves and profit. Neil, I’d say the salient difference is that one assumes the terrestrial farmer owns his stock. Under Scots law, riparian owners most decidedly do NOT own the fish (until the fish is caught, it belongs to no one). A further difference is that I know of few terrestrial farms where the land on which the stock is held is continually flowing past, and what’s in Farmer Blogg’s ‘territory’ at noon is in Farmer Briggs’s ‘territory’ half an hour later. Fiona – I am a lawyer so I know you are technically correct but all this “riparian owners own the right to fish but not the fish themselves” is a load of legal-schmegal which is obscuring the real issue. The simple fact is that he (she, they, it) who *controls* the right to fish a river between points A and B controls the destiny of the fish therein. Can we concentrate on that very simple fact of life please? Who should that person with the control be? “There is a clear case for management of salmon and sea trout stocks to be overseen by government, on behalf of the people” you say in your article (although you don’t tell us what that case is!) yet you also say “I for one have never suggested that management should be ‘handed over to the community’”. These seem to be rather conflicting messages. I come at this from the starting point that you have a “tragedy of the commons” type situation such as overfishing the North Sea (is that not an example of stocks being overseen by government (the EU) on behalf of the people?) as against the truism that someone who owns something is more likely to take care of it than anyone with any lesser interest – which is precisely the argument being advanced by tenant farmers for ARTB. Can you articulate more clearly what it is you are proposing rather than indulging in mother and apple pie platitudes spiced up with bits of legal guff like “res nullius”? Management by professionals, whether paid for by state license as is the case in NZ, and management by the community, are two different things. As I previously mentioned, many tenant angling associations manage the water, but essentially have a free hand over too many things (stocking) and not enough power over others (poachers, those bag-limits). Rent, and the parochial, town-to-town nature of many associations, means they can’t afford these things as things stand, and many don’t want them either, as ‘us and them’ kicks in – a well known local many see it as his own club and not want anyone else bringing rules which many weaken their authority. Lastly, the main problem SAFC is with the disgusting prices on some rivers. It’s outrageous that the majority of Scots anglers who have fished here all their days will never fish the good beats of the Helmsdale or Tay because the whole industry is based on money, and an Indian cricket player or London banker comes first. We have very humble aims, and reform will be coming one way or another. Does a riparian owner really ‘control the destiny’ of wild fish that might spend just minutes or hours transiting ‘his’ section of the river? This seems to be elevating the laird to the status of a deity. What control does the riparian owner have over whether or not a fish dies from sealice, seal predation, marine pollution, weather conditions, etc? The problem seems to have been very clearly spelled out. Riparian owners have a vested interest because the value of their beat depends entirely on the number of fish caught by rod and line on that beat. They are therefore likely to focus on that rather than the wider conservation and economic interest. Therefore they are not sufficiently independent to manage the resource. There is a parallel with deer. Estate values depend on the number of stags shot, and we have seen deer numbers escalate to the detriment of native woodland, peatlands etc. Much of the (currently inadequate) cull is disproportionately funded by the taxpayer – the FC own 9% of the land but shoot 28% of the deer – while at the same time some estates are feeding the deer in winter to swell the numbers beyond the capacity of the land. The wider conservation interest is ignored in favour of self interest of a very few people. Very nicely articulated Peter, thank you. My point (not clearly enough expressed) was that the fishery owner controls the destiny of the fish for the time (however brief) they are in “his” water (although as you rightly point out there are lots of other factors impacting on a migratory fish’s “destiny” at other stages of its life cycle) and legal niceties like what is owned prior to catch is the right to fish, not the fish themselves, etc. etc. seem to me to be beside the point and obscure the core message. You have very succinctly spotlighted that as being that, as fisheries are valued by numbers caught, the temptation for a fishery owner is to haul as many fish out the water as possible irrespective of wider management considerations. So what’s the solution? Some sort of statutory “Salmon Commission” that is not dominated by fishery owners and has powers (and funding) to carry out research and mandate management measures such as compulsory c&r, catch limits etc? Very interesting parallel you make with deer as well. Am I not right in thinking the Deer Commission was wound up and merged into SNH? Perhaps SNH should be invested with the suggested functions regards salmon? I’m sure we’ll come back to this in Andy’s next blog about deer (currently being investigated by the RACCE committee as well). Surely where the habitat is favourable, fish are more likely to hold – scientific recording shows us that without habitat there are generally no fish. A riparian owner pays a fishery rate based on the catch return, the more fish caught the higher the rate. Rates go DSFBs who in turn employ people, undertake habitat works and in some cases run hatcheries. I know deer are not the subject of this blog (at the moment) but numbers can be controlled by a voluntary s.7 agreement or a compulsory s.8 agreement where required, both of which have been used successfully in recent years. More accurate counting is also now feeding into the system promoting more realistic culls. NK raises interesting legal points and I would agree with his comment that when someone owns something they are more likely to take more care of it than someone with a lesser interest. That said there are tenants in all sectors that have a willing commitment to invest in assets given that they can see the commercial benefit they will enjoy. I have also had a further look into the NZ case study and Doug Emmetts comments about the UK, interesting given they have the Victorians to thank for introducing trout amongst other species, some of which they have spent the past 40 years trying to eradicate with aerial drops of 1080 poison, often to the detriment of their indigineous species. In all of this, the problem is not necessarily at river level but elsewhere. The key fact is that riparian owners have opened up their water and are widely advertising fishing at rates less than a season ticket for an SPL club. Many are also undertaking positive habitat works but decide not to shout about it. I do think most contributors have lost sight of the fact that salmon spend the best part of their lives at sea. Of course habitat protection in rivers, looking after spawning beds and re-stocking are important. But only two out of ten fish return, in some years only one out of ten, apparently with diminishing returns since research begun in the 1960s when returns of up to 40 percent were recorded. There are lots of factors at play, from abundance of food to predators, from high sea fisheries to pollution from fish farms. Some people even believe it has to do with climate change (the catch-all of our time). This has certainly very little to do with allegedly rapacious riparian owners. Exactly correct Reiner. But the owners should not be allowed to charge for fishing. Forgive me if I missed something earlier in this thread but if owners are not to be able to charge for fishing then where will the funds come from to manage the fishery? A couple of other points. I would challenge the assertion that riparian owners only interest is maximising the number of fish caught. It is far from that simple. Clearly it is desirable to ensure the long term success of the fishery which means not exploiting the resource to the extent that it damages that long term resilience. Certainly the rivers on which I have experience have well established catch and release, conservation and enhancement programmes. This is funded via rates by the proprietors and through additional investment by the proprietors in the RAFTs and through habitat improvement on adjacent properties. All this activity is of course incentivised by the commercial practice of letting fishing. I am far from clear how the mooted “community” or public models would support the fishery other than by letting the fishing by those who wish to pay. Finally not all fishing is expensive. The best is, yes. But then doesn’t that apply to all products where demand exceeds supply? But there is plenty of fishing available at modest prices either by the week or day. That is certainly the case with our own fishing where we’ve long had a policy of letting it in a way which provides lots of opportunities depending on your price point. we have to appreciate that we are discussing natural assets and wild fish, ownership of the land right to the bank is one thing but then to have laws which allow the fishing rights to hold the trump card on any particular stretch is unhealthy. Fishing permits should be affordable and available for all to enjoy, by creating a huge price scale is simply dividing wealth and class even further. SEPA or SNH need to hold the power then the rivers can be used by all for different types of activity. Community is a good word, giving everyone some responsibility can have amazing effects. These rivers are not man made! Fishing is available but its price will vary depending on its attractiveness. Pretty rivers with a high chance of a catch command more than the opposite. Who over owns then these rules will apply. You can get a days fishing on the Findhorn for £30 or you can pay the equiv of £200 per rod / day during a plum week. The price reflects the chance of catching a fish. The price isn’t some artificial figure plucked from the air its the consequence of the demand for that fishing over time setting a price for its desirability. Clearly government could artificially constrain that price but why should it unless it plans to intervene in all areas of our lives where desirable products are unaffordable to some people. I wouldn’t go so far as to say the riparian owners’ only interest is to maximise the number of fish caught. But I think it is true that their direct financial interest may affect their judgement, either consciously or subconsciously. As has been seen, riparian owners often use their influence on charities and the various regulatory bodies to oppose things like canoe access, despite the fact that there is no scientific evidence that this is harmful to the fish. It gives the impression that some people are protecting their own interests (having exclusive use of the water) rather than those of the fish. I don’t have a problem with people protecting their private interests but it should not be dressed up as conservation. Though I have some sympathy with Scottish Anglers for Change, I tend to agree that people living in the catchment area of a good Angling Association (especially in rural areas) do have access to good fishing at a reasonable price – at least that is my experience as an AA member myself. But most of the population is now urban, and better access to fishing for the aforesaid lad in Possil seems desirable. I sometimes wonder what would happen if there was some ‘no-permit-required’ public salmon fishing available. It might well be disastrously exploited in a frantic free-for-all rush. But I believe there is some ‘free’ trout fishing in Scotland (I’m told Loch Ba does not need a permit, but haven’t verified this), there is certainly ‘free’ sea fishing and there is ‘free’ wildfowl shooting on Crown foreshore. In no case does there seem to be over-exploitation. But maybe salmon are different. Peter, i agree with you, but there is a problem in this country and that is where rights and law are so poorly adopted that it leads to negative experience. Like being told to stop fishing in a sea loch because the laird is at home. Or fishing for wild brownies in a hill loch and being asked to produce your license. We have got it all wrong. I understand Andrew H and why the price structure is there, but to allow the wealthy to monopolies the best fishing, on a natural river for wild fish, is simply paying for privilege. Paying for peace and quiet and not having to mix it with the locals! Then people become obsessed with a stretch of river and protect it, as if anybody else visiting would be utterly destructive. There are rivers in Scotland where even if you walk along the bank, you will be challenged by a game keeper. We need to start again and remove the elite structure from this natural asset. I’m loathe to derail things further on to deer on a thread about salmon, but would appreciate brief clarification. I fully accept the point about more accurate counting, but I understood that SNH have never used their compulsory deer control powers under section 8. But if I am wrong I would be glad to be corrected. The next scheduled blog is all about deer so maybe hold fire until then. Much has been said about the elite structure that owns a natural asset. I know ex-trawlermen, plumbers, electricians, joiners and crane drivers, all of whom own riparian rights, all because they enjoy fishing. They sometimes struggle to let what they don’t use for their own purpose, even when it is advertised at reasonable rates (£30/day). I haven’t seen anyone grumble at the cost of skiing at Glenshee, Cairngorm or the Lecht. What is the difference between snow on a mountain and water in a river? At the end of the day the cost of the lift pass maintains a facility enjoyed by many seasonal visitors enjoying a natural asset in rural Scotland and provides much needed and significant seasonal employment. No different to a charge for fishing in a river. This season has shown some of the lowest salmon catch returns in many years due to low rainfall. Sadly it is not possible to have a good summer and good fishing. However, on the plus side I am unaware of any ghillie or estate worker who was made redundant as a result. In an industrial scenario I would suggest that the situation could have been very different. Riparian owners take the long term view and the results of this season will be down to a factor outwith their control. Next season will be trickier, given the fickle nature of some visiting fishermen who are more concerned by the catch return than the experience. It would surprise me if there are any redundancies at the end of next season, or even the season after that. There will not be many riparian owners who show a profit after the cost of employment, vehicles, bank repairs, insurance, staff accommodation costs, fishery board rates, management and advertising are taken into account, let alone draw funds from the business. Glad to see you are back . Could you please be good enough to answer my questions to you on Andy Wightman’s Community Engagement and Landed Hegemony on October 27 2013 at 2.51 pm . thank you . Not really relevant to this thread but I’m sure RICS will respond if you contact them. When I asked if any complaints had been received about rent review practice by members the response was in the negative. I assume that from what you say that over the last 20 years not one member of R I C S has stepped out of line . that is quite a record to keep ?? . My second question , which you omitted to answer , was for your account of what J D A Williamson the landowner of Alvie and Dalraddy Estates wrote ‘ that the decline in our country started when those who own it ceased to run it ‘ . could you expand on this comment to let us know how Lairds of big Scottish estates think .?? . If you read my response you will see I said that RICS indicated, when I asked, that no complaints had been raised about rent review procedure / behaviour. That was a few months ago. That does not mean RICS haven’t taken action against members. Those offences weren’t relevant to the strand in question. I’m sure RICS will give you chapter and verse. As for Jamie I suggest you ask him. I’m sure he’ll elaborate. I haven’t read his response to understand the context but on the face of it I don’t agree with the assertion. I find it staggering that Estates and their henchmen think tenants with a grievance would turn to RICS for help? Wild Salmon are considered a greater asset than a tenant. Nice link to fish to keep it relevant.we can go back to tenancy matters on the next relevant blog. look forward to it Andrew. Is J D A Williamson not a typical laird of Scotland’s estates ?? . I thought that he was recognised as being one . It’s a bit simplistic to think all landowners and managers would share the same view. We’re as varied a bunch as the rest of society. I also doubt that Jamie’s view is also as simple as one selected quote suggests but I can’t speak for him. what could we do to fix it Fiona? I can only commend everyone to read Lesley Riddoch’s book (published by Luath Press), which she wrote from a perspective of having lived & studied in the Scandinavian countries for a few years. During my time with the Pew Environmental Trust, I was able to pick up some knowledge of how rivers and stocks are managed in Norway, and I’m well aware that their equivalent of the ASFB believes that fragmented (more democratic?) ownership creates its own problems. I think that just proves that there are no simple answers! But, as Riddoch points out (read in particular the chapter ‘Scotland’s Natural Assets – Look, but don’t touch’), the more egalitarian approach to land ownership & access which prevails in countries like Norway means that ordinary people have much more confidence in their own ability to handle their own destinies, and that of their natural resources. We need to learn that as a nation, and it won’t be an easy lesson. I suspect that there’s more than a hint of the Russian serf in the current Scottish psyche, because over the last couple of hundred years we’ve become so used to people who speak differently from the rest of us, and have vastly different life-styles, telling us what’s good for us. We need to grow up! The Russian serf element of the Scottish psyche is all to evident in some. Fortunately it’s disappearing now but nowhere near fast enough; it may take a few more generations yet or it may be hastened by independence, who knows? How do you locate this psyche? I’ve never seen it yet. Does it show itself as an inverse halo, perhaps? And if it is disappearing, should it not be preserved, just like Burns suppers which also seem to forge an everlasting feeling of Scottish-Russian brotherhood? What office does /did J D A Williamson hold in committees involving estates that you know of ??. We need to foster the FEELING of independence in Scotland, whether we get the political version or not. I loathe hackneyed new-agey terms like ’empowerment’, but by God, do we need empowerment here. I’m encouraged by the fact that the Norwegians managed it – what was effectively a colonised country for a long period, and a poor one at that, with few (obvious) natural resources at the beginning of the 20th century. Look how far they’ve come in a few generations. I think it will be more difficult for the Scots, because the global economy and global culture have become so much more complex in the last hundred years. If we achieve independence, but fail to shake off our deference to the particularly unacceptable faces of modern global capitalism (as evidenced by the way Wee Eck has danced to Donald Trump’s tune), we’ll be no better off. We surely have a unique opportunity to forge something closer to self-determination. If that requires independence to kick-start it, then I’m for independence. But we might as well all give up & retire under our slimy stones if we don’t AT THE VERY LEAST use this opportunity to achieve a lot more power for the Scottish Parliament. Either independence or devo-max; in my view, either will do, as long as we start believing in ourselves and our ability to manage our own affairs, and taking responsibility for our own welfare on a local basis, and acting like grown-ups rather than like Celtic fans in Amsterdam. What on earth has this got to do with the preservation of salmon? Keep to the subject, Fiona! reiner, its got everything to do with salmon preservation. read it properly and try to keep up! I actually think it’s part and parcel of preservation of all our country’s resources. We’re too used to being told ‘You can’t do that/you don’t know enough about it/it’s none of your business,’ and believing it. If we hadn’t been so willing to accept what those & such as those tell us, do you think that such a huge part of our country would be owned by so few people, and that we’d have ACCEPTED having fences across ancient rights of way, and tenant farmers put out of holdings that have been in the family for generations, (http://www.heraldscotland.com/news/home-news/farmer-in-row-over-land-is-found-dead.19067272). By the same token, we’ve been too willing to accept the opinion of the Duke of wherever and Lord whatever that the salmon are ‘their’ fish. It’s not the subject of this thread but the Hearld piece showed a complete lack of understanding of the case it referred to so it misrepresents the legal position to suggest tenants can “put out” of holdings in a way which suggests it is common place. It is not and not is it possible under the law. legal this, legal that, Andrew have you ever heard of pressure, threatening conversation, legal clout? but then you think that RICS can sort it all out for a tenant. Crumby legal offerings, just give the peasants a little bit and shut them up for another ten years. “Legal this and legal that” happens to be important. The law as regards Ag holdings is often misunderstood and mis-reported. Regrettably this was often so with the Salveson case. If that happens you can hardly expect the debate to be properly informed. As regards your assertion about poor behaviour you can hardly expect RICS to take action if its not reported to them. If people persist in not dealing formally with what they see as transgressions of proper behaviour then it becomes harder to distinguish between genuine areas of concern and a carefully orchestrated campaign to discredit the land management profession. I suspect we have a heady mixture of the two at present. no Andrew you have missed the point. just in case you are not aware Jamie Williamson , laird of Alvie Estate , was awarded the first ever accreditation certificate under the Wildlife Estates Scotland initiative . This is a much coveted award within Estates in Scotland . Everything that is said and done on such an Estate will have been taken note of . Therefore , if Jamie Williamson responded to the Land Reform Review Group’s call for evidence by quoting ” that the decline in our country started when those who own it ceased to run it ” then a lot of lairds must have the same opinion , or he would not have won . Not healthy when 432 people own half of Scotland . All freshwater fishing enhabited by salmon and seatrout should be in the hands of the Crown estate. Management of these fisheries needs to be run by local boards – NOT PROPRIETORS who don’t even live on most of the adjacent estates and couldn’t care less anyway, if you don’t reside you don’t have a say! Lairds can do what they like with their and but should have no control over the water passing through. ASFB, RAFTS, SEPA, SNH and local angling clubs can deal admirably with sensible proper fishery management at local levels. Slurry Sturrer is absolutely on the money, Lairds simply must not be permitted to own the water and fishing, it is not conducive to appropriate fishery management. Most ( even in this day and age ) are not even interested in commercial gain, they run the Toffs playground for the Toffs and employ a skeleton workforce on generally barewasted land. There is a lot to be said for nature tourism also which can reap great rewards for rural areas. Pity most of the native wildlife as been exterminated because of the UKs most invasive species, sheep. The Highland estate policy has not only oppressed the rural economy but the land also. A modicum of rewilding would not go amiss!